The question lives on over whether an operating permit for a gun club is an issue of safety or land use. 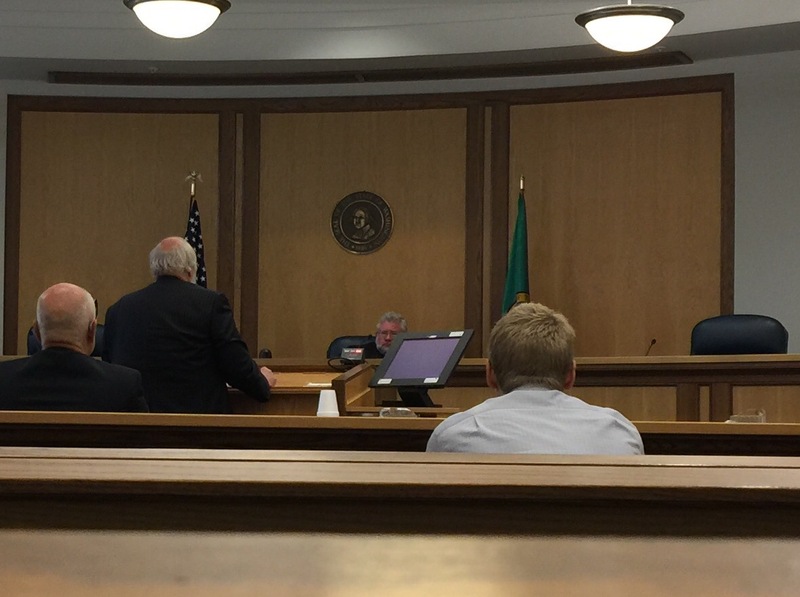 Wednesday morning lawyers for the county and the Kitsap Rifle and Revolver Club made their arguments in front of a Court of Appeals commissioner in Tacoma. Washington Appeals Court Division II Commissioner Eric Schmidt hears argument s from Dennis Reynolds, attorney for the Kitsap Rifle and Revolver Club. The club is appealing the preliminary injunction that stopped shooting at the Seabeck Highway property in April. Commissioner Eric Schmidt said he hoped to have a written decision on the appeal before a Kitsap Superior Court hearing on whether to make the preliminary injunction permanent until the club files for an operating permit. What’s in place now is an emergency measure. Dennis Reynolds, speaking for the club, told Schmidt the club believes the operating permit, which he referred to as a “special use” permit is essentially the same as a conditional use permit, which makes it a land use issue. As such, he said, the county doesn’t have the right to stop operations at the club for noncompliance with the new law, unless it can show what the legal world calls “great injury.” He said the injunction should not be in place until the courts sort out how the new law should be enforced. “Right now we have a club that’s effectively put out of business,” Reynolds said. The land use issue has been effective before on another court involving the same two parties. An earlier Court of Appeals ruling agreed with a Pierce County Judge that the club was a “public nuisance,” because it had expanded beyond what it had been granted under a conditional use permit, but disagreed with that judge that shutting the club down was the right remedy. The county argues that the conditional use permit and the operating permit are separate issues. Christy Palmer, deputy prosecutor said the conditional use permit deals with zoning, while the operating permit deals with safety. “We want to ensure the safety of the community. We want to make sure bullets don’t leave the range,” she said. An operating permit would require the club to show, using descriptions and drawings, how it will maintain a safe range. The Poulsbo Sportsman Club applied and, last I heard, was one drawing short of approval, but is still in operation. KRRC didn’t apply, which is why they’re not allowed to be in business, Palmer said. Reynolds, who earlier said the club had lots of respect for Kitsap Superior Court Judge Jay Roof and that it took its time considering whether to appeal, later in the hearing questioned whether Roof had been able to rule fairly. The club has taken issue with the comments Roof made in April when he rendered his decision, saying he had been threatened and praising the County Prosecutor Tina Robinson for thinking beyond politics in seeking the injunction. On March 26, 2015, the Kitsap County Hearing Examiner stated that public safety was one of the four elements that he would use to make his decision concern a 35 year operations agreement for Ueland’s mining operation in the Chico Watershed, specifically the Dickerson Creek Basin. The Operation Agreement is part of the Conditional Use Permit.